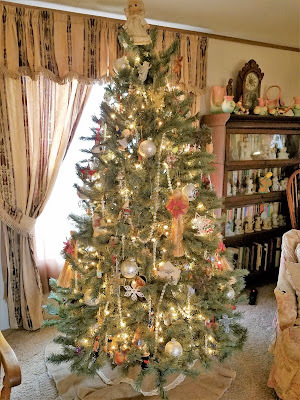 to share a few Christmas traditions. 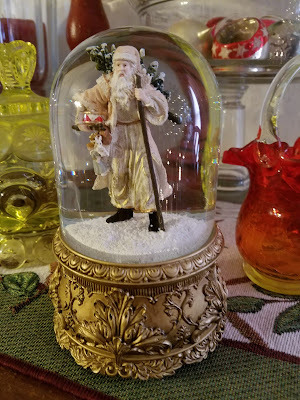 In our home, we have a few special traditions that we take part in -- tea parties, building gingerbread houses, baking cookies, collecting ornaments, and even playing tricks with Elf on the Shelf. Below are a few facts about Christmas traditions and how some of them began. it with small candles to honor Christ's birth. Candy Canes - originated in Cologne, Germany in 1670 when a clergyman and choirmaster gave children hard white candy shaped with a shepherd's crook to keep the young quiet during church service. Holly - Its sharp edges are symbolic of the crown of thorns worn by Jesus at his crucifixion. The red berries represent blood. Santa Claus - originated with Saint Nicholas, a 4th century bishop and patron saint of children, who threw gifts to them through their windows. He began a feast day for children on December 6. The tradition of giving gifts also came from the wise men who brought gifts to the baby Jesus. Nativity or Creche - said to have originated in 1223 by St. Francis of Assisi, who set up a manger scene in the woods for his people to commemorate the nativity of Jesus. Included in the scene was a manger, hay, an ox and donkey. As we decorate our homes for the holidays, "may we never forget to see in our hearts the little Babe of Bethlehem who came to save us from our sins", and who is, after all, the one and only reason we celebrate this Holy Day.